Standing cup; bowl of heliotrope, cut in scroll form; base of silver-gilt, formed of figure of man walking and carrying bunch of grapes and staff wreathed with vine; from his back springs a trunk of vine which continues up the back of the cup, with tendrils and grapes and is surmounted by a monkey; hexagonal base with animals in full relief. Openwork. Origin: Uncertain; no silver punch-marks; previously described as 'German, about 1630', but more probably only the figure has this origin, the cup itself being created in its present form by Reinhold Vasters of Aachen (Germany) about 1865-70, but certainly before 1872. Provenance: Baron Anselm von Rothschild, Vienna, between 1866 and 1872 (cat no. 566), by inheritance to his son Baron Ferdinand Rothschild (d. 1898). Commentary: In Schestag 1872, this standing-cup was described as “17 Jahrhundert” - no doubt because of the costume worn by the grapepicker and the figure's superficial resemblance to a well-established group of German early seventeenth-century silver figures forming the stems of cups - especially those in the shape of a large bunch of grapes, known in German as ‘Traubenpokal’ (for an example in the Waddesdon Bequest by Hans Petzolt of Nuremberg (master 1578, died 1633), which has a Bacchus 'caryatid' figure, WB.103 (see Hugh Tait, ‘Catalogue of the Waddesdon Bequest in the British Museum: Vol. II. The Silver Plate’, London, 1988, pp. 218-25, pl. VII, figs 221-30)). Fortunately, two unaltered and well-documented examples of the German ‘Traubenpokal’, each including a male figure (dressed in contemporary costume, wearing a broad-brimmed hat and striding forward) forming the stem and supporting the tree-trunk that rises vertically up to the bowl in the shape of a bunch of grapes, have survived: one in the Grünes Gewölbe, Dresden, and the other in the Moscow Kremlin. The Dresden silver-gilt example, made by the Nuremberg goldsmith Paulus Baier (master 1613, died 1659), is 58 cm tall and the grapepicker not only holds in his outstretched left hand a staff wreathed with a vine (as on the Waddesdon Bequest heliotrope cup) but has the tree-trunk supported on top of the huge bin strapped to his back (inv. no. IV, 21; J.L. Sponsel, ‘Das Grüne Gewölbe zu Dresden’, vol. II, Leipzig, 1928, p. 182, no. 16). The Moscow silver-gilt example, on the other hand, is even more relevant because the tree-trunk emerges from between the shoulder-blades of the grapepicker (just as on the Waddesdon Bequest heliotrope cup); also made by a Nuremberg goldsmith - the monogrammist PS - the Moscow example is 55.5 cm tall and dates from the beginning of the seventeenth century (see G. A. Markowa, ‘Deutsche Silberkunst des XVI-XVIII jahrh, in der Rüstkammer des Moskauer Kreml’, Moscow, 1975, no. 31, col. pl.). Not only is the costume of the grapepicker on the Moscow ‘Traubenpokal’ very similar to that worn by the London figure but both figures have been modelled with the same swinging contrapposto movement and even the two raised bases, with their emphasis on naturalism, are executed in the same mixture of applied and low-relief details. However, the scale of the figures surviving within the stems of these tall standing-cups tends to be significantly smaller than the London figure of the grapepicker. Late sixteenth-century examples, like the woodman stem of the famous 1576 Praun family nielloed silver cup and the peasant stem of the 1598 Strasbourg cup by Nicolaus Rapp (see R. Sänger, Gold- und silberschmiedekunst , Bergkristall- und Steinschneidearbeiten, ‘Die Renaissance im Deutschen Südwesten’, exh. cat., Heidelberg Castle, Badisches Landesmuseum, Karlsruhe, 1986, pp. 645-7, nos L 53 and L 56), are approximately half the size of the London grapepicker. Another early, but small, silver-gilt cup with a stem composed of a standing peasant carrying a tree-trunk bears the mark of Nuremberg and of the maker, Hans Kellner (1553-1609), and, uniquely, the wooden model for this stem has also survived (see Lorenz Seelig in ‘Modell und Ausführung in der Metallkunst’, exh. cat., Bayerisches Nationalmuseum, Munich, 1989, pp. 47-8, cat. nos 13-14 (col. pl. on cover), where both the silver cup and the model are dated “um 1590”; the silver cup, which is in the form of a beehive, was lent from a private collection and the wooden model (inv. no. R. 811) belongs to the Bayerisches Nationalmuseum). In contrast, many of the later German sculptural examples, especially those silver cups preserved in the Moscow Kremlin since before 1663, and in the royal collections in Copenhagen and Stockholm, offer convincing evidence that there was a consistent and powerful trend towards larger 'caryatid' figures within the stems of standing-cups, particularly among those produced by the Hamburg goldsmiths (see J. I. Smirnowa and B. Heitmann, ‘Gold und Silber aus dem Moskauer Kreml: Meisterwerke Hamburger Goldschmiedekunst’ Museum für Kunst und Gewerbe, Hamburg, 1986, nos 17, 18, 22, 23, 29, 30 and 32, with illus. ; E. Schliemann (ed. ), ‘Die Goldschmiede Hamburgs’, vol. II, Hamburg, 1985, no. 191; for two Nuremberg examples completed in 1632 see Göran Aim in ‘Sweden: A Royal Treasury, 1550-1700’, exh. cat., ed. M. Conforti and G.Walton, Washington and Minneapolis, 1988, p. 110, no. 24). The presence of the tree-trunk emerging from between the shoulder-blades of the London grapepicker establishes beyond doubt that the figure was made to form part of a stem, and consequently the figure is either a surviving fragment from a very large standing-cup (the rest of which has been lost) or was created specifically for this heliotrope standing-cup, which was only acquired by Baron Anselm between 1866 and 1872. The objections to accepting the latter explanation are that it does not take into account the alterations to the brim of the hat nor the very perceptible differences in the goldsmith's work that exist between the grapepicker, on the one hand, and the monkey and the vine on the other. The former explanation, however, recognises the inconsistencies of workmanship and style within this grapepicker heliotrope standing-cup as it is presently constituted. Foremost among the features that strike a jarring note is the form of the heliotrope bowl itself - a shape that has no parallel among the products of the late sixteenth- or seventeenth-century Court workshops. Secondly, the lapidary's lack of mastery of his craft is particularly noticeable wherever he has attempted surface ornamentation; for example, where he has carved two scrolls in low relief (on either side of the monkey) and where he has attempted to introduce two coiling volutes on the rim of the bowl. Neither the form of the bowl nor the workmanship of the carving is, therefore, consistent with the proposed dating in the first half of the seventeenth century. Secondly, the surface texture of the trailing vine and the seated monkey is greatly inferior, for example, to that created in 1631-3 by Hans Lambrecht II, a Hamburg goldsmith, whose ‘Traubenpokal’ has a sculptural stem composed of a naked, hairy 'wild man' within creeping vines with green leaves (see M. Bencard and G. A. Markowa, ‘Christian IV’s Royal Plate’, Rosenberg, 1988, p. 88, no. 24, figs 40-1). This standing-cup, presented in 1644 by Christian IV of Denmark to the Tsar of Russia, has survived in the Moscow Kremlin, and the sensitive flat-chasing, giving the impression of hair on the body of the seated mythical 'wild man', is strikingly different from the crude way in which the fur of the monkey has been rendered on the London heliotrope standing-cup. 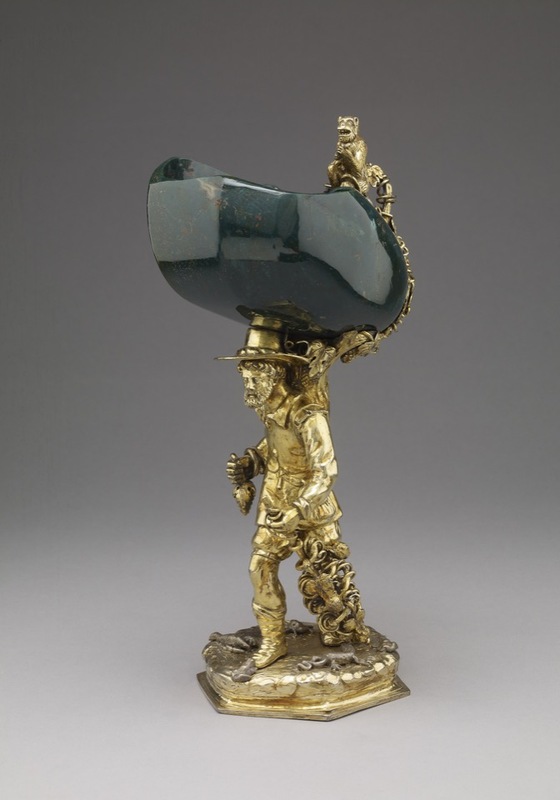 The tentative suggestion is, therefore, made here for the first time that the goldsmith and faker Reinhold Vasters, using the old figure of a grapepicker (perhaps Nuremberg, c. 1630), was responsible for creating the present heliotrope standing-cup because of the close comparisons that can be made between the workmanship of the upper half of this cup and the Waddesdon Bequest's quartz standing-cup (see WB.122). The latter, which is demonstrably a product of Vasters' workshop in Aachen about 1865-70, was also acquired by Baron Anselm between 1866 and 1872. Furthermore, this heliotrope standing-cup is very similar in certain respects to the Waddesdon Bequest chalcedony standing-cup (see WB.121) and, because the latter could be taken apart, its nineteenth-century origin has been more firmly established. Significantly it, too, was acquired by Baron Anselm between 1866 and 1872. Reinhold Vasters (1827-1909) was irrefutably interested in this type of German sculptural silver, as the author's recent study of the 1,079 drawings auctioned from his Aachen workshop in 1909 and, since 1919, preserved in the Victoria and Albert Museum has confirmed. Among the drawings are several that show silver objects with 'Atlas' figures supporting the upper parts, and in particular there is one large pencil drawing of a woman grapepicker walking in profile to the left (reg. no. E. 3568-1919). In this drawing the figure is depicted wearing a dress of the period (c. 1600) with a large bin strapped on her back and, held in her right hand and reaching to the ground, a staff wreathed in a vine with many bunches of grapes - just as on the Waddesdon Bequest's grapepicker heliotrope standing-cup. The drawing also shows her carrying a bucket-shaped basket in the other hand and standing on a raised circular base, with naturalistic details and a moulded foot-rim. At present, this drawing does little more than provide evidence of Vasters' involvement with this type of silver figure. It cannot even be assumed that the drawing is from Vasters' own hand, or that it represents an existing object. However, apart from his possible experiences since 1853 as a restorer at the Aachen Cathedral Treasury, there is now detailed evidence of Vasters' skill in combining old parts with new restorations (see Hugh Tait, New light on Reinhold Vasters as a restorer and a faker, in ‘Fake? The Art of Deception Symposium’ (based on papers read at the Fakes Symposium, 1990, British Museum), London, 1992). Therefore, his workshop, where many hardstones were set in pseudo-Renaissance mounts, seems the most likely place where this grapepicker heliotrope standing-cup would have been 'cobbled' together. No doubt it was sold shortly afterwards to Baron Anselm in Vienna - between 1866 and 1872 - perhaps through the agency of Frederic Spitzer (1815-90), the Viennese dealer and antiquarian, who had settled in Paris in 1852 and had developed close business connections with both Aachen and Reinhold Vasters. Franz Schestag, ‘katalog der Kuntsammlung des Freiherrn Anselm von Rothschild in Wein’, zweiter theil, Vienna, 1872, no. 566, with illus. Hugh Tait, 'Catalogue of the Waddesdon Bequest in the British Museum. II. The Curiosities', British Museum, London, 1991, no.31, figs. 284-290.